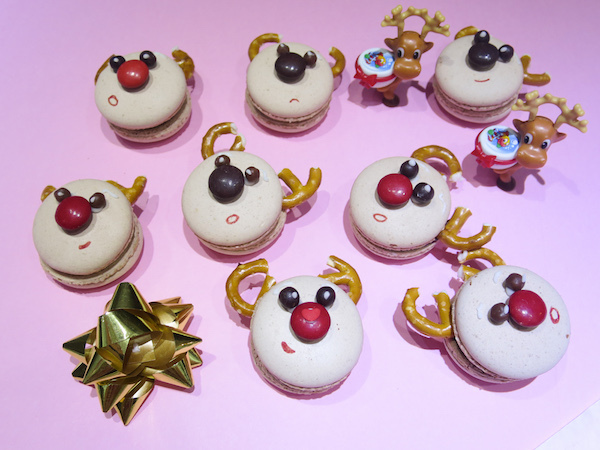 Cute reindeer macarons to pull Santa’s sleigh towards your way! 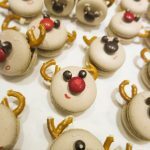 Rudolph the red nose reindeer and his friends are adorable treats for Christmas and the decorating part is a fun activity for kids aged 6+. 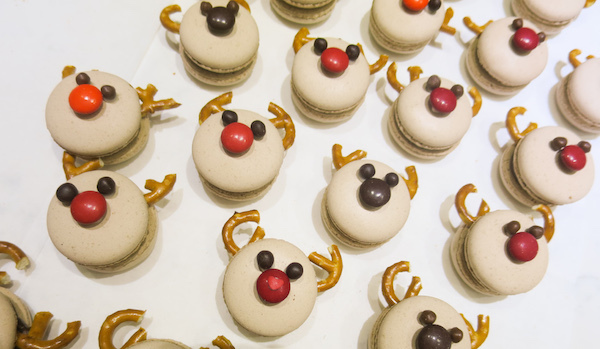 These reindeer macarons are cocoa macaron shells filled with RICH CHOCOLATE frosting, using recipe from Hershey’s Cocoa box (100% cacao – natural unsweetened), their horns are salted mini pretzels (be prepared to break more than you’ll need as they are quite fragile), noses are milk chocolate m&m’s and eyes are mini milk and dark chocolate balls. Preheat oven to 150°C (300°F). Prepare baking sheet with parchment or silicone baking sheet. Divide egg whites placing half in a mixing bowl. Place the granulated sugar and water in a small sauce pan and put it on the stove on medium heat, at the same time start whisking the egg whites in the mixing bowl on medium speed. Bring the sugar to boil and let it boil for one minute until it comes a thick syrup, then slowly pour the syrup into the egg foam continuing to whisk on high speed. Combine the finely ground mixture with the remaining egg whites and mix until fully incorporated. When the meringue forms stiff and glossy peaks, remove from mixer and combine with almond paste by gently folding using a spatula or a big spoon. 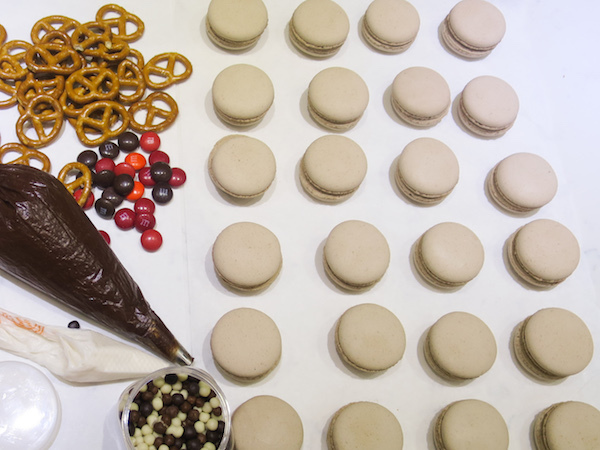 Place into piping bag with large round piping tip and pipe the macaron shells onto your baking sheet. Gently tap the baking sheet few times on the counter to break any possible air bubble in the batter. Bake in preheated oven for 16-18 minutes until you can lift them off the baking sheet. Allow to cool before taking off the baking sheet. Place frosting in piping bag with round piping tip, pair the cooled macaron shells, place royal icing in a separate piping bag cutting just a tiny bit from end and get m&s's, pretzels and chocolate balls ready. 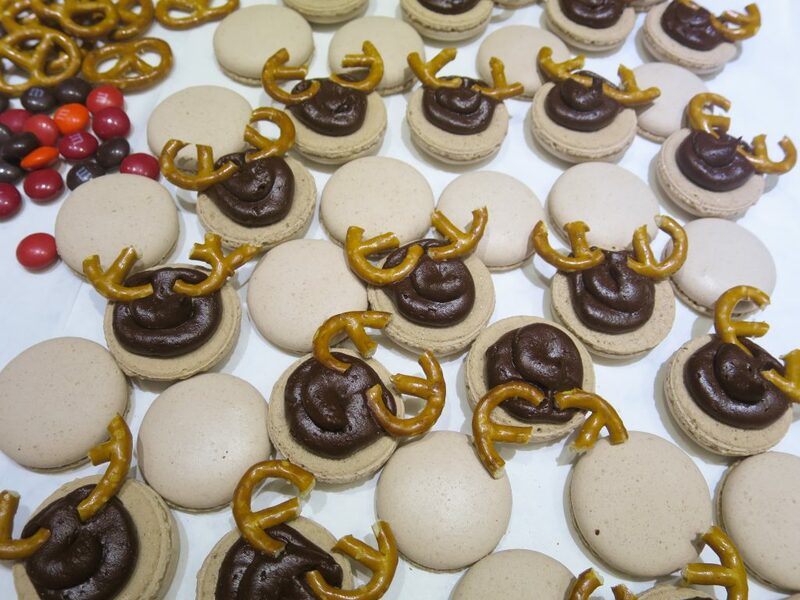 Pipe frosting on a flat side of a shell and place halved pretzels as the horns on top. Then top with another shell to make into a sandwich and using the royal icing as the glue, attach m&m's for nose and chocolate balls for eyes. 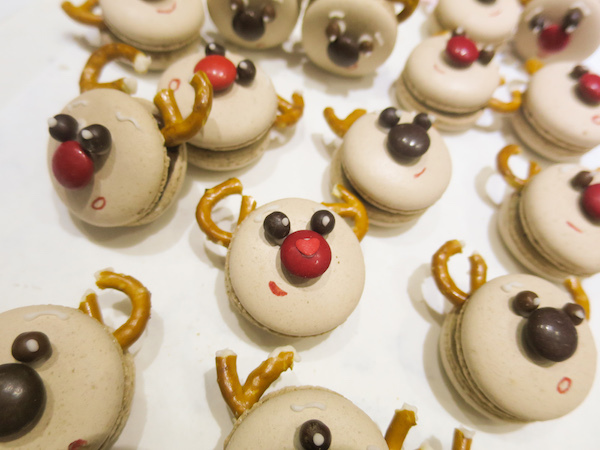 Add the reindeers some character by drawing them eye brows, pupils and snowy bits on the horns by using royal icing and draw mouth by using an edible marker. Refrigerate for 24 hours before serving. Enjoy!